Prints are not required. We can reverse engineer an existing part. One step molding process is more cost effective than machining blocks of plastic. Can produce custom molded parts to replace brass parts which require expensive machining. The parts can be slick with low friction if needed. Tooling for compression molded parts is very inexpensive in comparison to other forms of molding such as injection and transfer. Quick and inexpensive for prototype and small volume jobs. Delivery for a custom molded urethane part is very quick. Able to mold intricate shapes with or without metal inserts. We can quote from 1 custom molded part to over 1000 custom molded parts. Compression molding responds to a wide range of product sizes, shapes and performance requirements. Our molded polyurethane parts reduce the time and expense of machining parts from solid stock plastic. Urethane gaskets and urethane sealing products from Universal Urethane Products produce consistently dependable and reliable results for you. Our urethane seals are molded to tight tolerances and can be designed to withstand extreme conditions while maintaining the flexibility needed to seal in the most demanding industrial applications. Cast urethane seals provide excellent abrasion resistance, elasticity, chemical resistance and rebound. Universal Urethane Products in Toledo produces molded polyurethane seals economically in low and high volumes by utilizing multiple cavity tooling and compression molding presses. Universal Urethane provides precision urethane seals, manufactured with state-of-the-art equipment, using only urethane materials that pass our rigorous ISO 9001:2000 certification process. With our urethane seals you'll reduce equipment downtime and save on material costs. 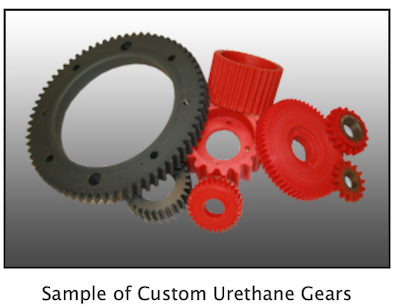 Universal Urethane offers custom urethane seal sizes, formulas, colors, and durometers. Our cast urethane bushings can be used in high impact areas where loads can exceed the capabilities of bronze or plastic. Our polyurethane bushings are formulated using high performance polymers. Universal Urethane Products is one of the world’s premier manufacturers of molded polyurethane and cast urethane products. We have molded millions of pounds of polyurethane for many industrial markets. We have been providing creative solutions from product engineering, mold designing, mold manufacturing and custom formulated polyurethane's to provide our customers with the best quality polyurethane molded parts. If you are seeking a world-class polyurethane manufacturer and a leader in molded polyurethane products and technology, then Universal Urethane is here to help. We offer a vast array of polyurethane compounds for your polyurethane molded parts. Polyurethane molding produces a wide variety of products for most industries. Universal Urethane has been the polyurethane specialist that companies around the world have depended on to gain all of the advantages of polyurethane for a wide range of parts. Polyurethane molded parts can be rigid and solid depending on the durometer you need. In addition, our extensive polyurethane stock ensures rapid turn-around for your polyurethane parts requirements. The formula for our success is based on the fact that we determine our customers' needs for design, delivery, and price - and we meet those needs better than any other cast urethane product manufacturer. Our in-house polyurethane molding design expertise gives us the ability to provide our customers with cost-effective tooling. Universal Urethane has been manufacturing polyurethane injection molding parts for several industries. Injection molded polyurethane products have been produced for various industrial sectors including transportation, building and construction, machinery and foundry, textiles, fiberglass, steel and aluminum, seals and wipers. Your possibilities with our varied polyurethane molding options are almost limitless, including compression, transfer and injection molded, extruded or calendared. Universal Urethane has 18 compression presses that mold thousands of products daily. We mold all of our standard and custom formulas as well as our entire range of durometers, 20A to 80D. The advantages of a molded urethane part versus machined plastic parts are numerous. The urethane is considerably tougher than plastic and the one step molding process is more economical than machining blocks of plastic. Tooling for compression molded parts is very inexpensive in comparison to other forms of molding. Universal Urethane makes all of its compression molds here in our own machine shop. Other advantages of compression molding are its ability to mold large, fairly intricate parts. Also, it is one of the lowest cost molding methods compared with other methods such as transfer molding and injection molding. We do not require blue prints to make a custom part. We can make your part from an existing part supplied to us. Compression-molding is also suitable for ultra-large basic shape production in sizes beyond the capacity of extrusion techniques.